The proposed residential development will be adjacent to the new Milwaukee Entertainment & Sports Center. 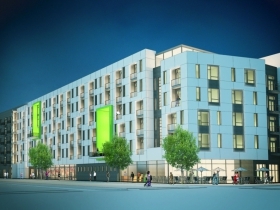 Bucks Apartments Rendering. Rendering by Engberg Anderson. 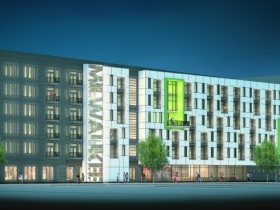 The Milwaukee Bucks today announced the selection of locally-based Royal Capital Group LLC to develop a 90-unit apartment complex within the new arena district. Renderings of the proposed residential development, which will be located along the eastern side of N. Sixth St. between W. Juneau Ave. and W. McKinley Ave., are available here. Construction of the residential units is expected to begin next fall upon majority completion of the parking structure. 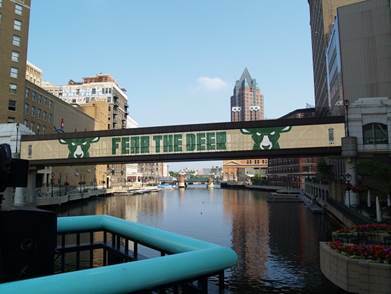 The Bucks initially began soliciting proposals from developers last March when the construction manager and design team for the parking structure were named. Royal Capital was selected from a broad group of both local and national developers interested in contributing to the project. The proposed residential development will feature 90 rental units built along the west-facing façade of Block 7 on Sixth Street, immediately north of the new arena where the scheduled parking structure has already begun construction. The development will include micro, one-bedroom and two-bedroom floor plans, including some designed as two-story lofts. Street-level activation along N. Sixth St. will include a neighborhood café, flexible event space and a sports lounge serving both residents of the development and the general public. Additional planned amenities include a rooftop terrace and club room, state-of-the-art fitness center and multiple indoor/outdoor lounges. “As fellow Milwaukeeans, Royal Capital is exceptionally excited to be a part of this generational development – not just as a transaction, but as a transformational opportunity for our hometown community,” said Kevin Newell, president of Royal Capital LLC. Royal Capital Group, LLC was founded by Kevin Newell in 2010 with a focus on urban development through real estate, innovation and venture. A Milwaukee native, Newell attended Custer High School in Milwaukee’s Hampton Height’s neighborhood before attending UW-Whitewater where he received his MBA. Royal Capital Group has grown to include over $100 million in real estate assets, the majority in multi-family housing ventures. Royal Capital is currently bringing a $32 million development featuring 181 residential units and a restaurant to Milwaukee’s Brewer’s Hill neighborhood, and is also a partner on a new mixed-used development to replace the Mill Road library branch with a new 17,000 square foot library and 55 mixed-income apartment units. 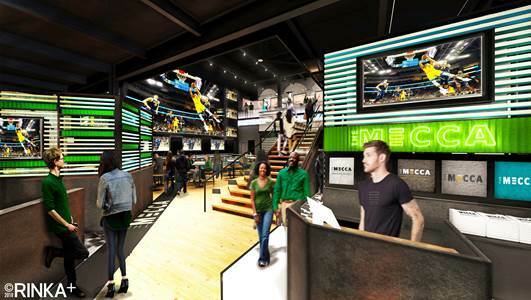 The proposed residential development will be adjacent to the new Milwaukee Entertainment & Sports Center, the centerpiece of an ambitious development project spearheaded by Bucks ownership to transform 27-acres of mostly vacant property into a vibrant retail and entertainment district in the heart of downtown Milwaukee. Scheduled to open in fall of 2018, the 714,000 square foot arena will be home to Milwaukee Bucks basketball and countless sports and entertainment events. The new arena was designed by Populous, Eppstein Uhen and HNTB, with Mortenson tabbed to lead the construction of the project. For more information, visit www.wisconsinesc.com.